Trello is a software tool to manage projects and workflows using Kanban boards. It can greatly support scientists. A primer. As a professor in electrical and computer engineering, I lead a team of 10–15 scientists and a nonprofit company. Over the past 15 years, I used various methods and tools to manage projects, keep track of the scientific work of doctoral students and postdocs, recruit dozens of people, and organize my own tasks in research, teaching, and administration. These methods have ranged from simple to do lists to sophisticated project management software. About four years ago I started using Kanban boards for all projects and personal tasks — today I can state that this method satifies my requirements and seems to be the most efficient and suitable method in my personal job setting. The idea behind Kanban boards in project management is best explained with a simple example: Take a whiteboard and divide it into columns labeled as To Do, Doing, and Done. Write your tasks on sticky notes and attach them to the To Do column. If you start a task, move the corresponding card to Doing. If you completed a task, move this card to Done. 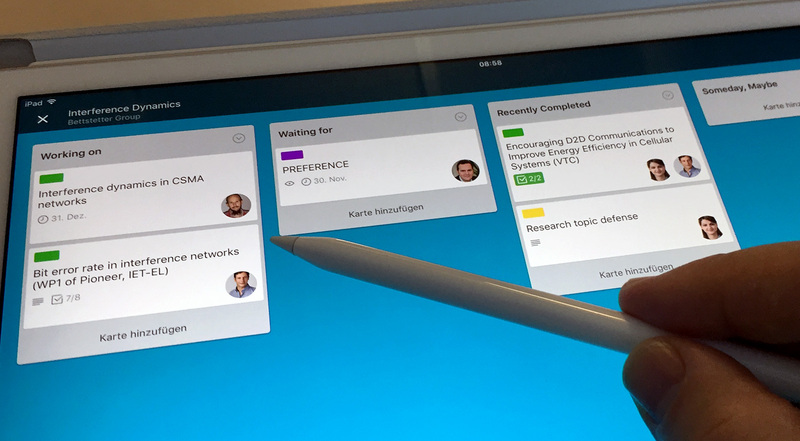 I do not use real physical cards and boards but employ the project management software Trello, which implements the principles of Kanban and supports collaborative work. 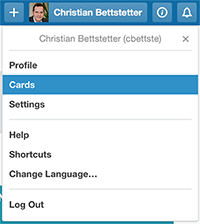 Trello is available via the Web or as an application for mobile devices running iOS (iPhone, iPad) or Android (including Fire). Trello is powerful enough to manage my tasks, yet simple enough to keep focus. Take a look at the Trello board of our research project “Interference Dynamics” in the screenshot below and let me explain how we set it up and use it. A card is a task within the project. We name the cards according to the task title and use color labels to indicate the task type (e.g., publication is green, proposal is purple, and talk is yellow). All project members have access to the board. The person taking the lead in a task (e.g., the first author or principal investigator) assigns himself or herself to the card. A deadline is set if applicable. A checklist within a card is created if needed. It is useful to create templates for common cards. A publication card, for example, should contain the typical workflow of a publication including nonscientific tasks, such as upload file to Webserver and make entry in university database, as these tasks are often of low priority for researchers. A publication or proposal card starts in Working on. Once it has been submitted for review, it will be moved to Waiting for. A publication that has been published can be moved to Recently completed. After some time, e.g., after writing a project report, the recently completed cards will be archived. Whenever the status of a card changes, each person following this card receives an email about these changes. The Someday, maybe column is used for spontaneous ideas and tasks that have been postponed. The Reference column is used for continuously ongoing tasks, such as maintaining the Website and writing project reports. The Goals column contains cards with the major objectives and/or milestones of the entire research project. I use group boards for all research projects and for some other processes with at least two persons involved, such as managing job applications. The project board is managed by the project leader, who invites the project members. The members can join Trello with their Google account or by creating a separate Trello account. In addition, I use personal boards to organize my personal tasks, including teaching and management activities. Each card can be commented by the board members. This feature can be used for online discussions and should be preferred against discussion via email due to the fact that the comments are stored in the system. A click on “Cards” yields your personal to do list. My staff members and I assign my name (only) to cards where I currently have work to do. The “Cards” item in the profile menu (top right) will then yield your personal to do list, which can be sorted “by board” or “by due date”. You can also set a direct link to this list using trello.com/user/cards. I admit that such a to do list is not the non plus ultra compared to lists created with specialized tools that offer priorities and other features to get things done. Nevertheless, the smooth integration of group management and personal to do lists offered by Trello on one single platform convinces me. Trello can be integrated with several other productivity and communication tools, including calendars, Evernote, Google Hangouts, and many others. Such connectivity capability is called Power-Ups in Trello. Boards belonging to a free (nonpaying) Trello user are restricted to a single Power-up at a time. Enabling more connectivity requires business accounts for the team members. Besides this, we also link to ShareLaTeX and repository servers (e.g., SVN) via the card description or comments. 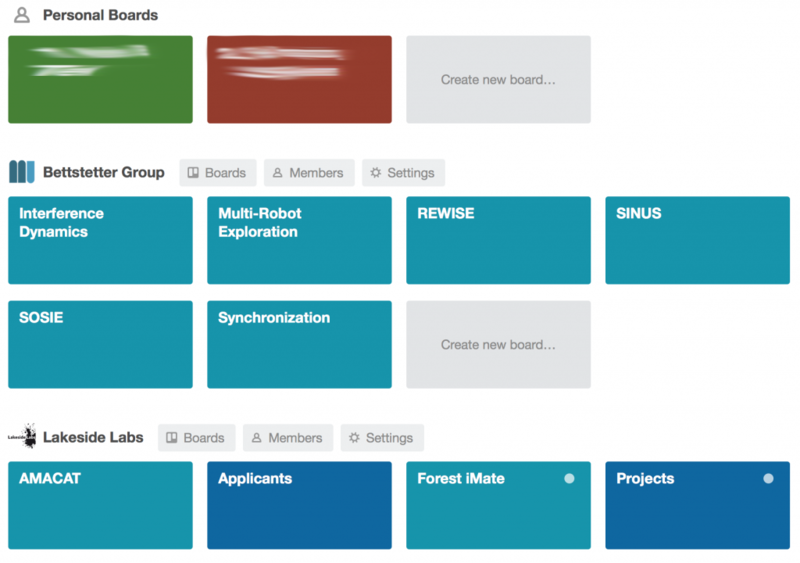 Update: An alternative to Trello is the open source kanban tool Wekan. This article is one of the most popular posts on my Website. It was also published at Medium, where you can leave comments and clap if you enjoyed reading. @bettstetter This is a terrific post! Do you use Slack by chance? We have a community there (including educators) that might be useful.